The future is right now. Don’t believe me? Well, let me tell you about my day. This morning I woke up and before I even opened my eyes I said, “Alexa, coffee.” Boom! Just like that my Smart Hub tells my Coffee Maker to start brewing a fresh pot. I know what you’re saying, why can’t I just set the timer on the coffee maker, you know the old-fashioned way. I guess I could, if I wanted to deal with confusing menus and buttons. Remember guys, this is the future, try and keep up. My WiFi connected appliances make everything easier. Like breakfast. I never used to have time to make breakfast. I was out the door, fighting traffic and if I was lucky maybe I grabbed a stale bagel somewhere. Now? While I was in the shower, I used my Smart Hub to tell my refrigerator that I wanted an omelette. Not only did it check my ingredients, and pick a recipe online, but it also told my stove to preheat, and my dishwasher what cycle it needed to be on to clean up afterwards. And if that isn’t enough, it even ordered more groceries afterwards. My fridge talked to my stove and my dishwasher, and then it used a grocery service. Like… what?!! Next thing, I get dressed and I’m about to serve up my breakfast, when I get a push notification on my phone. I take a look and it’s from my washing machine. There’s a brand new wash cycle that I can download. Do I want to do accept? Um, yeah, I do washing machine. I hit the green button, and my washing machine upgrades. How cool is that?! I’ve had my coffee, I’ve had a killer omelette and I’m walking out the door, when an alert pops up onto the Family Hub interactive display on my fridge. Apparently, my dryer needs to be repaired. 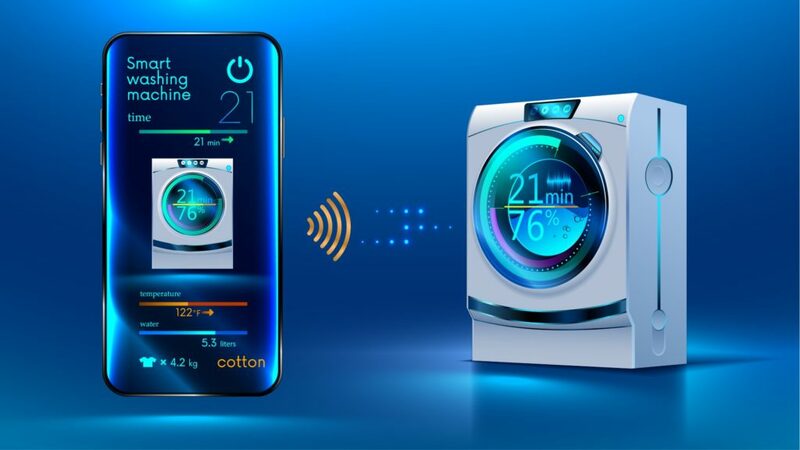 That’s right, thanks to my connectivity features my dryer can tell me when it’s broken. So, no problem. I hit “OK” and my dryer arranges for a service call. I told you, WiFi connected appliances make everything easier. But they’re also so much more. In all the commotion I forgot to turn off the stove before I left. It was stupid, it was dangerous, but luckily someone had my back. A few minutes later, I get a notification. Do I want to turn off my stove? I’m sitting on the bus, and I can use my phone to turn off my stove. At this point I’m thinking, this is a lot more than just convenient. Like I said, the future is right now. And when it comes to appliances, it’s only going to get better.